Section 43B(d) of the model GST Law defines an Electronic Commerce to mean the supply or receipt of goods and / or services, or transmitting of funds or data, over an electronic network, primarily the internet, by using any of the applications that rely on the internet, like but not limited to e-mail, instant messaging, shopping carts, web services, universal description Discovery and integration (UDDI), File Transfer Protocol (FTP) and Electronic Data Interchange (EDI) whether or not the payment is conducted online and whether o not the ultimate delivery of the goods and / or services is done by the operator. Section 43B(e) of Model GST Law defines an Electronic Commerce Operator (Operator) as every person who, directly or indirectly, owns, operates or manages an electronic platform which is engaged in facilitating the supply of any goods and / or services. Also a person providing any information or any other services incidental to or in connection with such supply of goods and services through electronic platform would be considered as an Operator. A person supplying goods/services on his own account, however, world not be considered as an Operator. For instance, Amazon and Flipkart are e-commerce Operators because they are facilitating actual suppliers to supply goods through their platform (popularly called Market Place model or Fulfilment Model). However, Titan supplying watches and jewels through its own website would not be considered as an e-commerce operator for the purposes of this provision. Similarly Amazon and Flipkart will not be treated as e-commerce operators in relation to those supplies which they make on their own account (popularly called inventory Model). It is mandatory for e-commerce operator to obtain registration. According to Section 19 r/w Schedule-III of the model GST law, provides that the threshold exemption is not available to e-commerce operators and they would be liable to be registered irrespective of the value of supply made by them. A supplier of goods/services supplying through e-commerce operator not entitled to threshold exemption. As per Section 19 r/w Schedule-III of the model GST law, provides that the threshold exemption is not available to such suppliers and they would be liable to be registered irrespective of the value of supply made by them. Section 43B(a) of the model GST Law defines aggregator to mean a person, who owns and manages an electronic platform, and by means of the application and communication device, enables a potential customer to connect with the persons providing service of a particular kind under the brand name or trade name of the said aggregator, for instance, Ola cabs would be a aggregator. An aggregator required to be registered under GST. Section 19 r/w Schedule-III of the model GST law, provides that the threshold exemption is not available to aggregators and they would be liable to be registered irrespective of the value of supply made by them. In terms of Section 43C(1) of the model GST law, the e-commerce operator is required to collect (i.e deduct) an amount out of the consideration paid or payable to the actual supplier of goods or services in respect of supplies of goods and/or services made through such operator. The amount so deducted/collected is called as Tax Collection at Source (TCS). 2. The time of payment of any account in cash or by any other mode to such supplier. In terms of Section 43C(3) of the model GST Law, the amount collected by the operator is to be paid to the credit of appropriate government within 10 days after the end of the month in which amount was so collected. 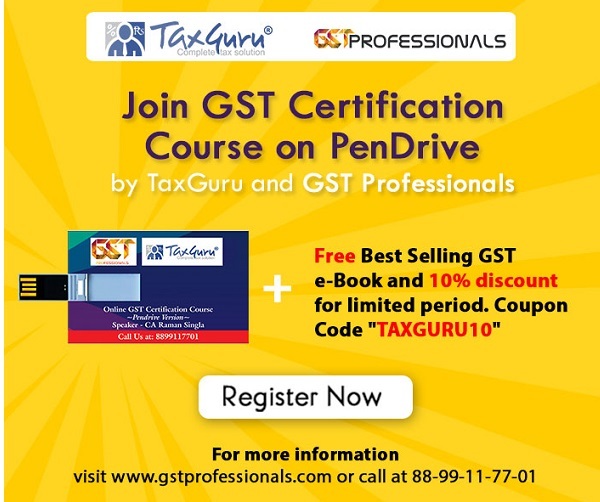 Further, in terms of Section 43C(4) of the model GST law, the operator is required to file a Statement, electronically, containing details of all amounts collected by him for the outward supplies made through his Portal, within 10 days of the end of the calendar month to which such statement pertains. The said statement would contain the names of the actual supplier(s), details of respective supplies made by them and the amount collected on their behalf. The Form and Manner of the said Statement would be prescribed in the GST Rules. TCS which is deposited by the operator into government account will be reflected in the cash ledger of the actual registered supplier (on whose account such collection has been made) on the basis of the statement filed by the operator. The same can be used at the time of discharges of tax liability in respect of the supplies by the actual supplier. 2. Stock of goods held by actual supplier making supplies through such operatory in the godowns or warehouses belonging to the operator and registered as additional place of business by the actual supplier. The operator is required to furnish the above information within 5 working days from the date of service of notice asking such information. In case of failure to furnish such information, the penalty could be extended to Rs. 25,000/-. In terms of Section 43C (4), every operator is required to furnish a statement, electronically, of all amounts collected as TCS towards outward supplies of goods and/or services effected through it, during a calendar monthly within ten days after the end of such calendar month. The statement shall contain, inter alia, the details of the amount collected on behalf of each supplier in respect of all supplies of goods and / or services effected through the operator and the details of such supplies during the said calendar month. As per section 43C(6), the details of supplies and the amount collected during a calendar month, and furnished by every operator in his statement will be matched with the corresponding details of outward supplies furnished by the concerned supplier in his valid return filed under section 27 for the same calendar month or any preceding calendar month. Where the details of outward supply, on which the tax has been collected, as declared by the operator in his statement do not match with the corresponding details declared by the supplier the discrepancy shall be communicated to both persons. As per section 43C(8), the value of a supply relating to any payment in respect of which any discrepancy is communicated and which is not rectified by the supplier in his valid return for the month in which discrepancy is communicated shall be added to the output liability of the said supplier, for the calendar month succeeding the calendar month in which the discrepancy is communicated. The concerned supplier shall, in whose output tax liability any amount has been added shall be liable to pay the tax payable in respect of such supply along with interest, at the rate specified under sub-section (1) of section 36 on the amount so added from the date such tax was due till the date of its payment.